In the weeks proceeding the Waddington Airshow the big question was "Will Vulcan XH558 make it to the show?" Due to the ever present funding issues the work needed to get '558 ready for the display season was held up, thereby missing some shows earlier in the season. Everything came together on the day, thanks to some herculean efforts, which made a big difference to the attendance figures over the weekend. 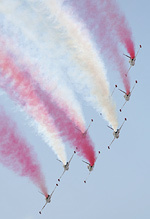 Paul Osborne reports on the RAF's premier airshow. Photos as credited. The airshow started off, as always, with the home team of Nimrod R1, E-3 Sentry and Sentinel making their respective flypasts. This was probably the last chance to see the Nimrod as it will be replaced early next year. 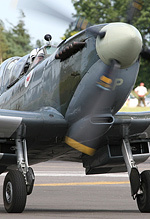 There were several themes to the show, one being the 90th anniversary of the first airshow held at Hendon. This was represented by a flypast of vintage aircraft including those of the Great War Display Team. The Turkish Stars made a welcome appearance after an absence of several years and marked the first time they've displayed at Waddington. They put on a well polished show with their formation of eight F-5s and ever amusing commentary. The Turkish Stars weren't the only eight-ship display team, the Red Arrows were one man, or should I say one woman down as Flt Lt Kirsty Moore was suffering from a bout of food poisoning. They may have been one aircraft short but the glorious weather on Saturday meant they could do their full height display. Jets, both modern and classic, were well represented this year. The Hunters, including a rather tasty FGA.9 in raspberry ripple scheme displayed with the Strikemasters of Team Viper, which concluded with a fast pass and the sound of the 'blue note'. An aircraft not seen for some time was the Sea Hawk of the RN Historic Flight making its welcome return to the display circuit. 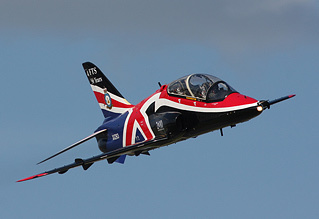 Modern jets consisted of Alpha Jet, Czech L-159 and Gripen, plus the RAF's Typhoon, Hawk, Harrier and Tornado GR4. The Tornado two-ship display was more of a role demo that had plenty of pyrotechnics to illustrate the point which probably didn't go down too well with the local skylark population! The Belgian F-16s arrived by escorting a Belgian Air Force A330 for a single flypast. During the week the Vulcan crew worked around the clock at Brize Norton, preparing the aircraft for flight, completing a test flight and practice displays. Even with this done there was no guarantee it would make it to the show, but on Friday afternoon all the paperwork was in place for it to appear, a huge achievement by all concerned. Instead of the aircraft relocating to Waddington for the weekend it remained at Brize Norton and flew in for its display before returning home. Despite not being able to experience the Vulcan howl on takeoff we were treated to a couple of high powered wingovers. The final manoeuver was a dirty pass before it roared skywards and turned for home, stirring stuff. 2010 sees the 70th anniversary of the Battle of Britain so naturally this was commemorated with aircraft from the Battle of Britain Memorial Flight and other privately owned aircraft doing a sedate chase of a Hispano built Buchon. 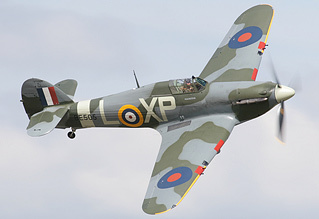 The BBMF's Spitfire MK356 also participated in a remarkable formation flight with a two-seater Typhoon (of the jet variety). A difficult display to fly due to the performance difference of the two fighters but the Coningsby based pair pulled it off admirably. This year's show was a great improvement on last years rather lacklustre show. Lets hope the 2011 show builds on this and puts the RAF Waddington International Airshow back at the top of the list of essential UK displays to attend.